The prettiest place to get pretty in Dallas. The Place: BAM Blowouts & Makeup in West Village. I dropped in on a Friday afternoon for BAM|Beachy ($45) for my hair and BAM|Bloom ($55) for makeup. The Appeal: I first found the salon on Instagram, where the clean, black-and-white aesthetic and a very pretty flower wall caught my eye. Although Dallas has California transplants Dry Bar and Blushington, we don’t have many beauty bars to call our own (R.I.P. La Bichette), so I was hopeful I might find a new local business to love. The Space: Situated between Bisous Bisous and MiniLuxe, BAM Beauty Bar offers a chic oasis with complimentary champagne and wine. Namdar designed the space herself, and her attention to detail shows. “From picking out the tiles to the flower wall, it was a labor of love,” Namdar says. For that towering flower wall, she enlisted a local artist, Tiana Mae Designs, who spent about five months hand crafting every flower out of high-quality watercolor paper. 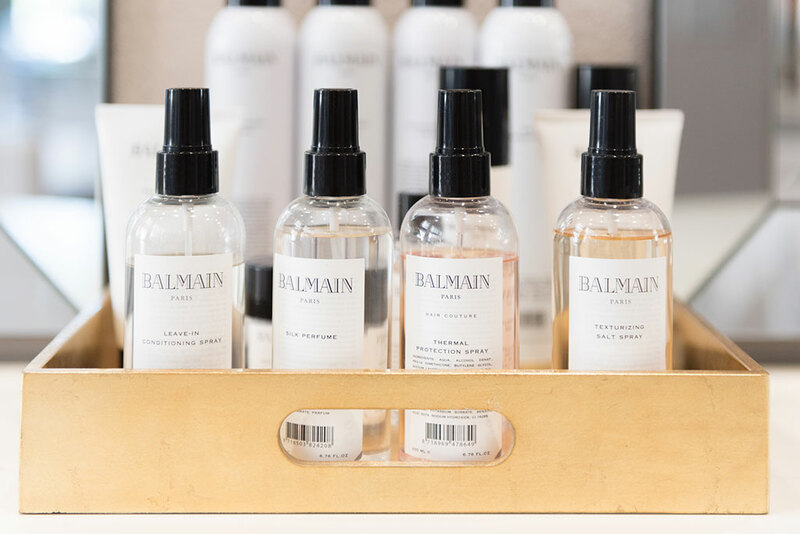 The Perks: For hair, BAM sought out the best brands in the industry, including Balmain hair couture and brushes, T3 tools, and Dyson hair dryers (whose quieter fans help keep the salon soothing). For makeup, the BAM team developed their own makeup line that’s hypoallergenic, non-comedogenic, and not tested on animals. How It Went: Carol (CJ) worked on my hair. After a pretty fabulous scalp massage, she got to work on my beachy waves using Balmain’s beautiful (looking and smelling) products, a Dyson hair dryer that was quiet enough for us to talk at normal volumes over, and a T3 curler. John, who worked at MAC for 7 years, started on my makeup next (although makeup and hair can be done simultaneously), and gave me the best natural looking makeup I’d had in years. Both CJ and John are “trainers” at BAM, meaning they train and keep an eye on new employees, but what most notable to me was how personable and knowledgeable they were. Topics ranged from hair care tips to Marvel movies and Taylor Swift’s new song. The Aftermath: I was going to be on a boat all day on Saturday, so I was hoping my beachy curls would last me through the weekend, which they absolutely did. You can tell what a difference it makes when you use such high-quality products for your blowout — though my curls had deflated a bit, my hair was reaping the blowout benefits for days. Bottom Line: I wanted to love a local blowout bar, and BAM made that super easy. I rarely get my makeup done or my hair blown out, but I think this salon might change things.